Convenient location, close to the bus station , to the city center it's a bit of a walk but still okay. There are restaurants right across from the hostel if you wish to eat there for lunch or dinner. Room had all the amenities, clean and spacious. Staff were friendly and helpful. Overall, nice place. Liked having hotel perks! The water pressure in the shower was not great and the walls are thin, so it was noisy at night at times. Great hostel, I would recommend it as it's quite a step up from most hostels. The female dorm room was quite spacious, with the separate shower and toilet ensuite being clean and convenient. 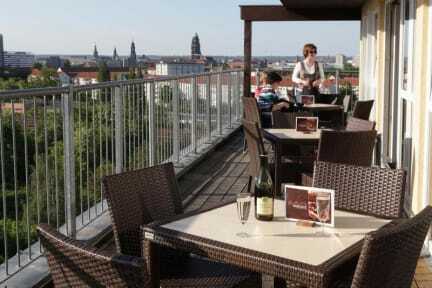 The skybar upstairs is a good place to chill out with a cheap drink and a view. I have since booked two more a&o hostels after this visit. It is bit far away from the old city, which all the main attractions are. But close to main train station. Had potential to be great, but needs an update. Major issue was that there were not enough outlets for everyone in the room and they were not near the beds. Nice bathrooms. Stayed for one night and the facility was clean. 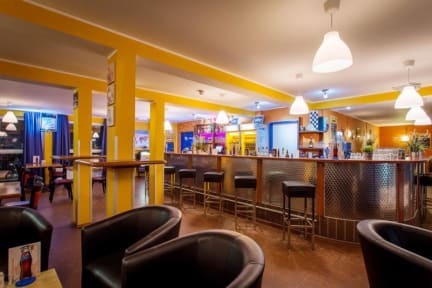 Staff was friendly and the hostel was a short walk from the train station and other attractions. During shift changes personnel opened the 4 section wide doors, while customers were sitting next to those doors near to reception. There were around 0 degrees celsium outside and it quickly became very cold. I've asked the hostel admin guy if the doors could be closed - he told me that the doors are broken. In a 20 minutes, he easily closed the doors - so they were not broken. I think this guy should pass customer service training. Also, the hostel should work on a security more!! !